The Lucozade Sport Goal Shield offers a cash incentive of $1,000 per goal in the opening round. And there were more than a few Pro League clubs that were happy for some extra loot. 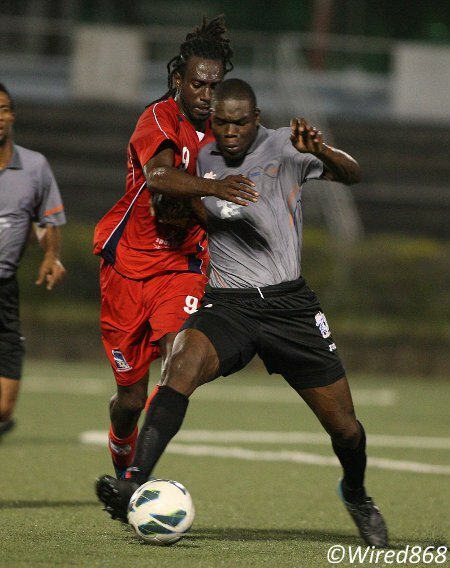 League leader, Defence Force, was the pick of the lot with a 6-1 hammering of table proppers, T&TEC FC, at the Ato Boldon Stadium in Couva while Neal & Massy Caledonia AIA whipped St Ann’s Rangers 4-1 at the Marvin Lee Stadium, Macoya and DIRECTV W Connection thrashed Police 4-0 at Couva. 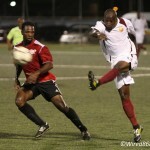 Photo: Caledonia AIA enjoyed a 4-1 romp over St Ann’s Rangers tonight. Rangers custodian Jan-Michael Williams (foreground) was not as impressed. 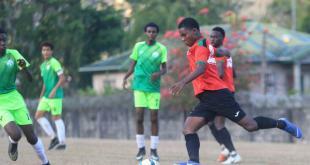 North East Stars ensured there were no upsets with a 1-0 win over Central FC in the remaining fixtures. It was Stars coach Angus Eve’s first win over Terry Fenwick’s Central FC at the third time of asking. 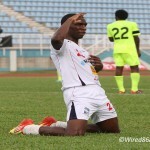 Eve spent six years under Fenwick at Jabloteh as a player and assistant coach respectively. Unsurprisingly, Trinidad and Tobago striker Cornell Glen was involved as he outmuscled Central defender Omar Charles in the opposing area before squaring for teammate Elijah Manners to tap across the goalline in the 28th minute. Glen pulled up lame, seconds before the halftime whistle, but the job was done. 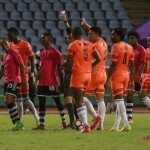 For all Central’s possession, the Couva-based club could not get a clear look at the opposing goal as Stars produced a resolute defensive performance to hang on to the result. 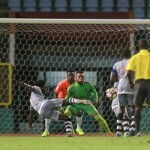 And it was not until second half stoppage time that Stars captain and goalkeeper Cleon John had anything more taxing than catching practice as he blocked a low effort from overlapping Central right back Carey Harris. 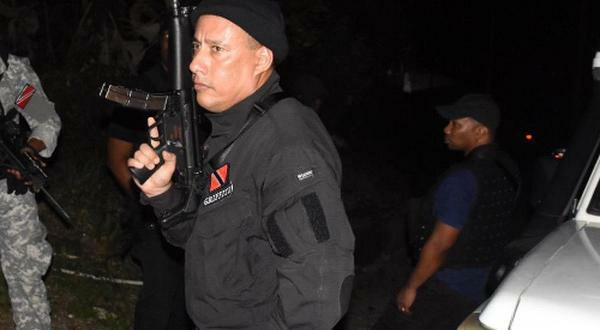 The Sangre Grande-based Stars will face Defence Force next Friday while Caledonia tackles W Connection in the other semi-final contest. Caledonia was in cruise control in the opening game at Macoya as four different players got on the score sheet in a game that was even more straightforward than the 4-0 result suggested. 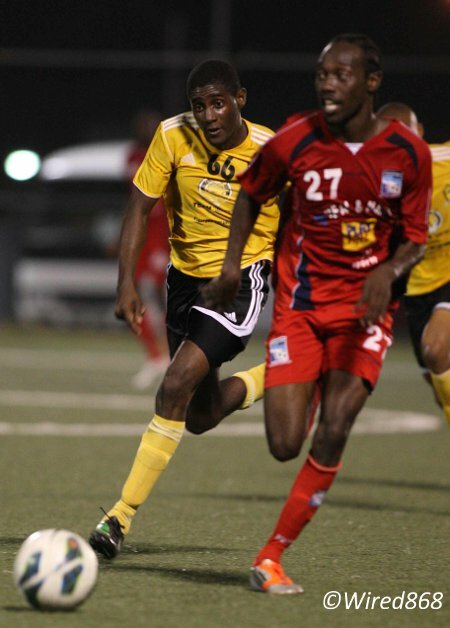 St Ann’s Rangers never convincingly applied pressure on Caledonia playmaker Densill Theobald or withdrawn striker Keyon Edwards and the Morvant/Laventille-based club took full advantage. At times, it seemed Caledonia was on the training ground judging by the ease in which its players shuffled the ball around the midfield and slipped passes into the channels. The “Eastern Stallions” might have gone ahead in the 32nd minute but for a sharp low save from Rangers goalkeeper Jan-Michael Williams to deny the overlapping Aubrey David while Rangers defender Jamal Jack made a vital diving header to block out a dangerous Nathan Lewis cross in the 39th minute. Photo: St Ann’s Rangers defender Jamal Jack (right) wrestles the ball from Caledonia AIA attacker Keyon Edwards in a rare moment of defiance. Unperturbed, Caledonia opened the scoring from the resulting corner with a thumping David header off Lewis’ set piece. It might have been 2-0 in first half stoppage time as Caledonia striker Jamal Gay collected a left side cross on his chest and sidestepped an opponent only for referee Gordon Maloney to whistle for halftime. Gay was not the only person at the Centre of Excellence dumbfounded that Maloney could not spare two seconds to see what happened next with the big man shaping to shoot. Barely a minute into the second half, Gay made up for lost time as he picked off a loose touch from Rangers midfielder Tyrone Charles and glided past Kadeem Drayton before flicking expertly into the far corner. Photo: Caledonia AIA striker Jamal Gay (far right) leaves St Ann’s Rangers defenders Kadeem Drayton (far left) and Muhammad Nakhid in his wake to score. 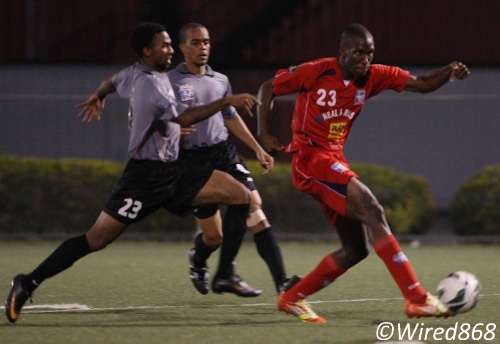 The 24-year-old Gay was Trinidad and Tobago’s first choice centre-forward for long stretches last year but has found it harder to get a call up in 2013 since the return of Stoke City frontman Kenwyne Jones and an in-form Cornell Glen. 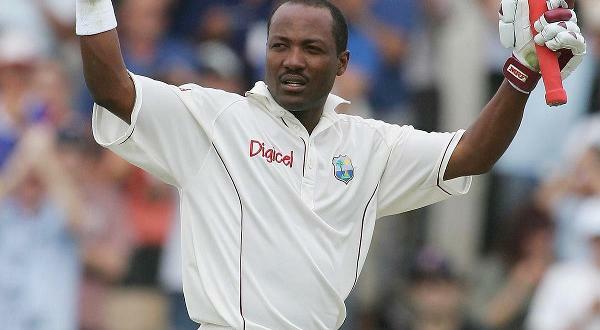 But, with goals like that, he is unlikely to be forgotten by the national selectors for too long. Theobald and Lewis came close to another Caledonia item while Devon Modeste also threatened with a snapshot before the game burst back to life with three late goals. Lewis glided through the Rangers defence before his low effort was saved by Williams in the 86th minute. But substitute Aaron Lester, who was making his first team debut, was well placed to hit the rebound into an unprotected net. Two minutes later, Lewis finally got the goal his performance warranted with a powerful volley into the roof of the net from inside the box after a good build-up that involved Lester and another substitute Sherron Joseph. Rangers did muster a consolation item in stoppage time as set piece expert Charles got a free kick to dip over the wall while curling away from Caledonia custodian Shemel Louision. Caledonia AIA: 1.Shemel Louision; 19.Nical Stephens, 5.Aquil Selby, 3.Nuru Muhammad (vice captain), 2.Aubrey David (25.Keron Bethlemy 89); 7.Stephan David (captain) (18.Sherron Joseph 82), 21.Densill Theobald; 27.Nathan Lewis (15.Aaron Lester 82), 9.Keyon Edwards, 17.Akim Armstrong; 23.Jamal Gay. Unused substitutes: 34.Kevin Dodds, 16.Odelle Armstrong, 29.Shakiyl Phillip. 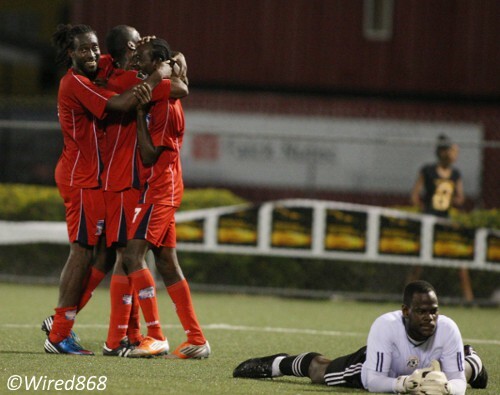 St Ann’s Rangers: 25.Jan-Michael Williams; 18.Muhammad Nakhid, 12.Jamal Jack, 23.Kadeem Drayton, 4.Jelani Peters; 26.Jemel Berot (11.Keifer Edwards 74), 7.Tyrone Charles, 15.Mikhail Awai (captaon), 16.Kurdell Braithwaite; 14.Cameron Roget, 10.Devon Modeste. Unused substitutes: 1.Zane Coker, 2.Alfie James, 9.Marvin Lee, 28.Shem Alexander. Previous Will Police get Lucky over the tragic Sea Lots accident?